Distinctive stairs occupy an important part of nearly every classic architectural style. Whether straight or curved, steep or gradually inclined, narrow or wide, grand or understated, stairs can make a stylistic statement of their own or be used to tie the whole house visually together. 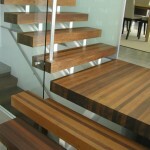 Balance and simplicity are sometimes all that is needed for an entrance stair. Economical use of material in combination with simple design can be incredibly elegant and graceful. Please click on an image below to view our portfolio for each design style. Informal and comfortable. 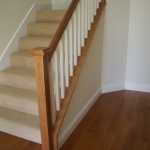 Rather than making a statement with a grand staircase, the Arts and Crafts staircase trend is toward the practical and warm look that emphasizes the beauty of wood. Subtle in detail but rich in craftsmanship, the emphasis is on the geometric forms that are created by linear design and simplicity. 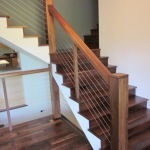 Cable balustrades have been designed for modern decks as well as modern stainless steel stairs but we have adapted the cable to work with modern interiors. Aidells-Oaks House- Greene and Greene architecture embodies the early arts and crafts movement. It is simple yet sophisticated with emphasis on the warmth of wood. Bertram/Blondina did the stair work, beam work, craftsman style mantle, massive ceiling hung pot shelf and solid Maple counter tops. 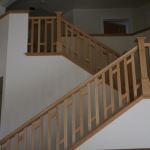 Some samples of our craftsman stairs. Similar to Arts and Craft style but distinguished by the sequencing of balusters, patterns cut into balusters or rectangular balusters. Our craftsman style encourages originality, simplicity of form, and the visibility of handicraft. The earlier craftsman usually made the moldings and trim on site with their available tools resulting in beveled cuts and linear design. 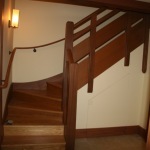 Formal Stairs and handrails are as much like furniture as anything. Balance and simplicity combined with a high level of detail and precision can produce stunning results in a stair and railing system. 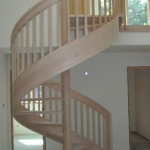 Contemporary or modern stair design can be very simple using distinct lines or elegant curves. 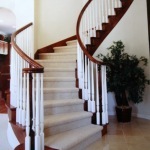 Most modern staircase design is simply detailed, exposing all the elements with minimal moldings, trim and decor. 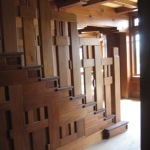 The modern staircase can be viewed as a piece of sculpture. The elegant turned outlines of Colonial balusters, the intricate ornament of Victorian newel posts, whether curved or straight, the traditional style is easily the most often and well liked style in use today. With a wide variety of stock turnings and parts available, it is often the most cost effective as well. 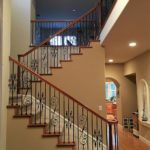 Combining ornamental metal balusters with wooden handrail systems gives an element of style distinction that is adaptable to several motifs in that the profile a baluster takes often suggests a particular style of architecture or furniture. Spiral stairs were originally designed in a clockwise ascent in order to fend off right-handed attacking swordsmen but have undergone many changes over the 2500 years since their introduction. Today spiral stairs are used as a space efficient way to achieve the next higher floor and if you are not worried about right handed swordsmen, they are also available in reverse-clockwise ascent direction.